That’s the reaction I got to this new dish. Seriously. I came up with it on a whim. 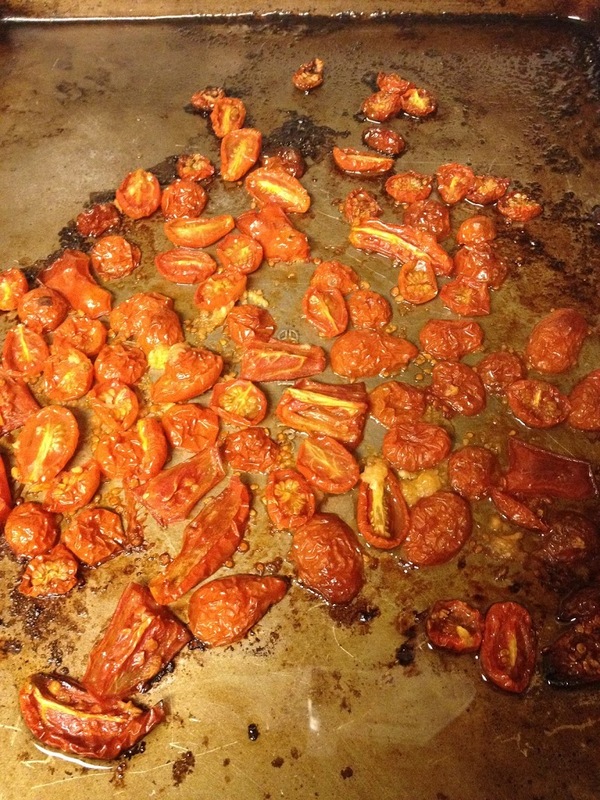 I had read about roasting tomatoes in the winter to bring out the tomato’s natural sweetness. For some strange reason that idea popped into my head today as I looked at the bowl of cherry tomatoes I had picked from my garden (before Debby rained and rained and rained and drowned my poor plants!) So I decided to something new and see how it turned out. I was well-pleased with the results! First I washed the tomatoes, halved them and tossed them with olive oil and kosher salt. Then I pressed two garlic cloves and mixed everything together and spread it out on an oiled jelly roll pan. Popped it into a 350 degree oven and cooked them for about 30 minutes. When they came out they were a little shriveled but tasted oh-so-sweet! When I was ready to serve dinner, I cooked a box of Barilla pasta in salted water until al dente. 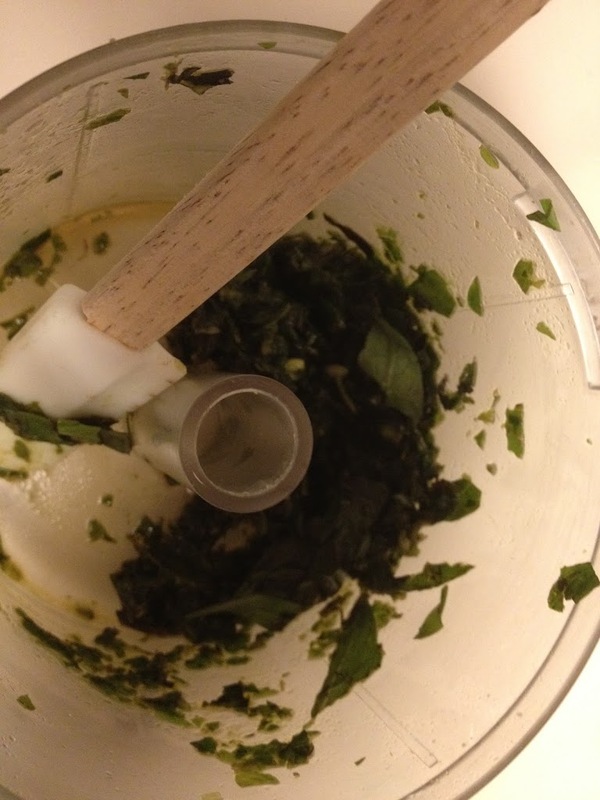 While the pasta was boiling I cleaned and de-stemmed a bunch of Thai basil I had left over from supper club and put it, along with another clove of garlic and some more olive oil in a mini food processor to chop everything up. 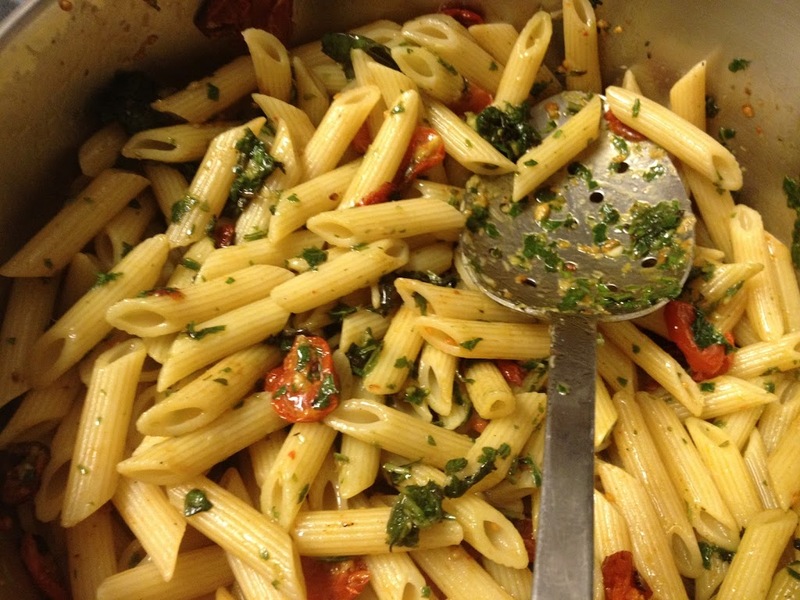 When the pasta was cooked and drained, I put it back into the cooking pot, scraped the roasted tomatoes (and the flavorful oil and tidbits) into the pot and then added the chopped basil and stirred everything, mixing well. 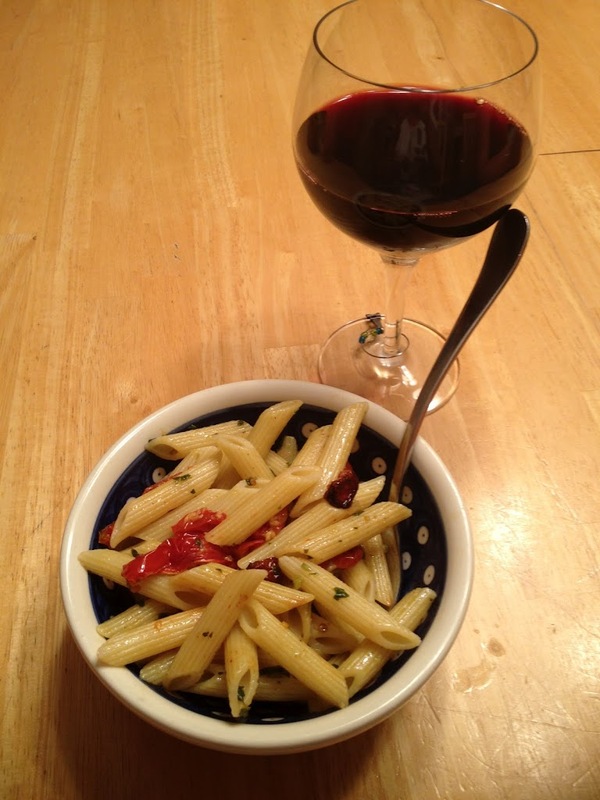 Of course a nice dish like this deserves a glass of vino to go along with it! Delizioso! I’m recording this so I can make it again, just as soon as I have more cherry tomatoes! I wonder if it will work with regular tomatoes? I just may have to give it a try!